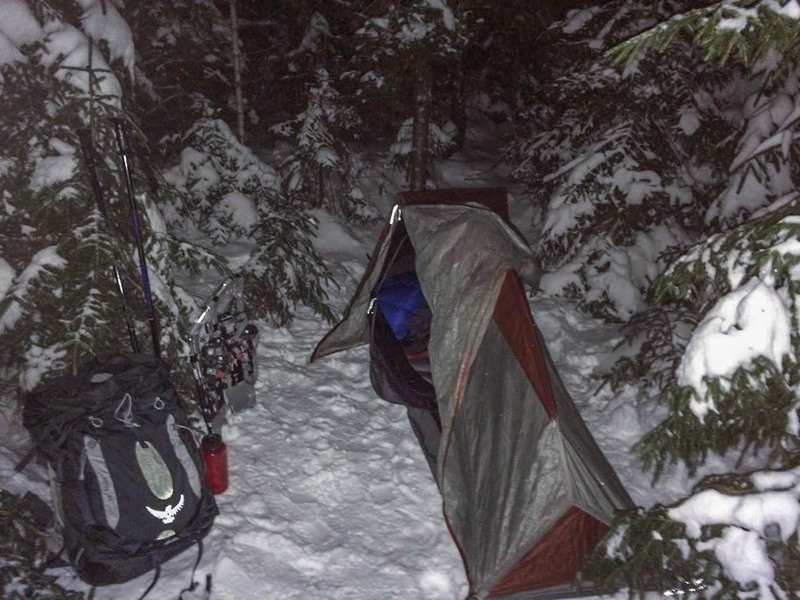 The first time I pitched my tent in snow was January 2014 when I experimented with winter camping in my three-season gear. Things went well and I made it through the night in temperatures in the single digits without freezing. I’ve learned a little bit since then and I had the chance to put my learnings to practice this March the night before I hiked Mount Tom. I wanted to share the experience here to help anyone else interested in camping in the snow. Disclaimer: I’m no expert, use your own judgement when camping in potentially dangerous temperatures and weather. Though I lived through my first winter camping experience, I woke up quite cold and I partially attribute that to not being able to pitch my tent properly. 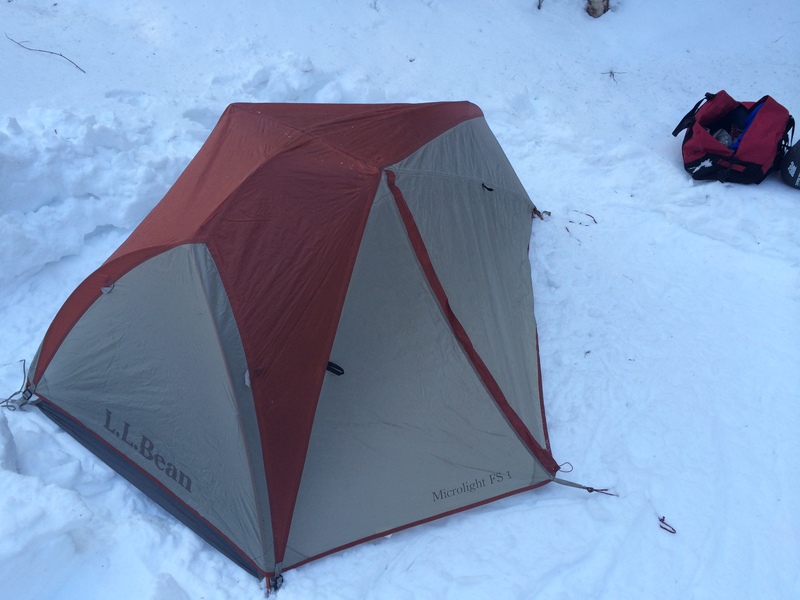 I love my L.L.Bean Microlight FS tent, I’ve slept in it under juniper trees on a Texas ranch and just below tree-line in the northern Presidentials. The inner mesh wall is freestanding, but the fly requires staking out the tent. That meant the fly was hanging loose on that first winter night, allowing cold air to blow in under the fly. First I chose my tent site and prepared it for the tent. I chose a spot near the trees and beside a snow bank created from plowing the campsite. This gave me nearly 180 degrees worth of protection from wind before I even started. 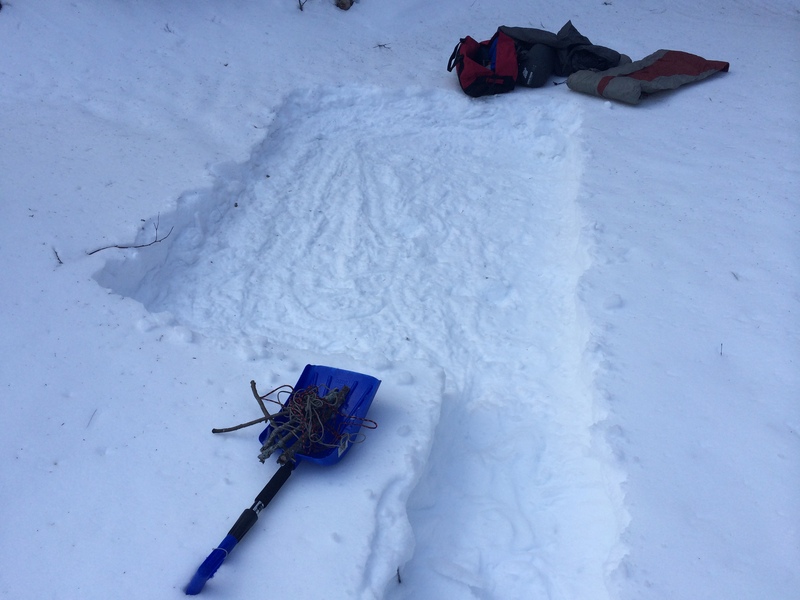 Then using my snowshoes I packed a path to my tent site from the kitchen (a picnic table and the fire pit that I dug out with the shovel I keep in my car) and packed down an area I deemed large enough for my tent. When I was clearing out the kitchen I snowshoed through the surrounding trees collecting twigs and branches to start a fire. The thickest of those I reserved to make my deadmen and broke into 5 sticks of about 8 inches in length. When I set up my tent I placed it in the location I wanted it and marked the placement of the deadmen sticks. I moved my tent aside and let the packed snow set for a while so it would refreeze packed and flat before actually securing my tent. While I waited I prepped another tent site for my friend who would be joining me that evening. Once enough time had passed for my site to refreeze, I started preparing the guylines I would need to affix my tent to the deadmen. 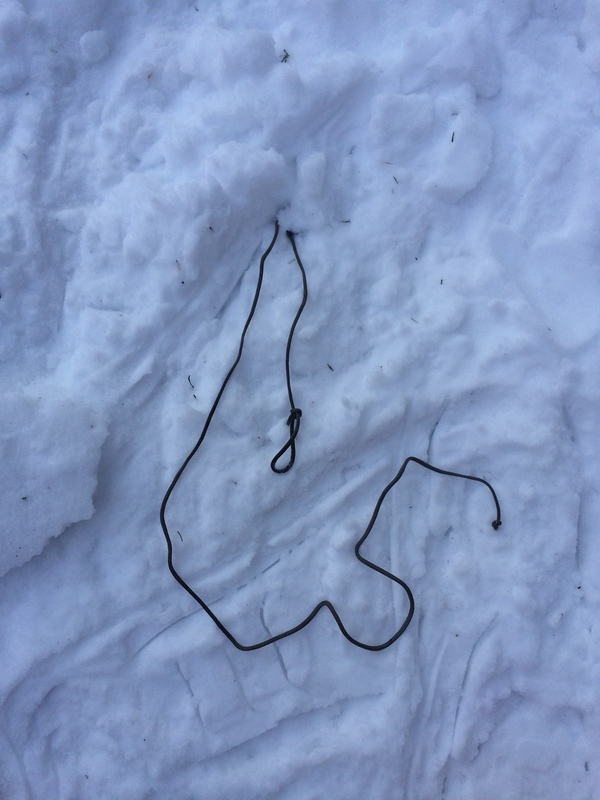 I cut 5 pieces of 505 cord a few feet long and tied a bowline on one end. Next I dug each of the holes for my deadmen. I dug the holes perpendicular to the angle the guyline would run to the corners of the tent. 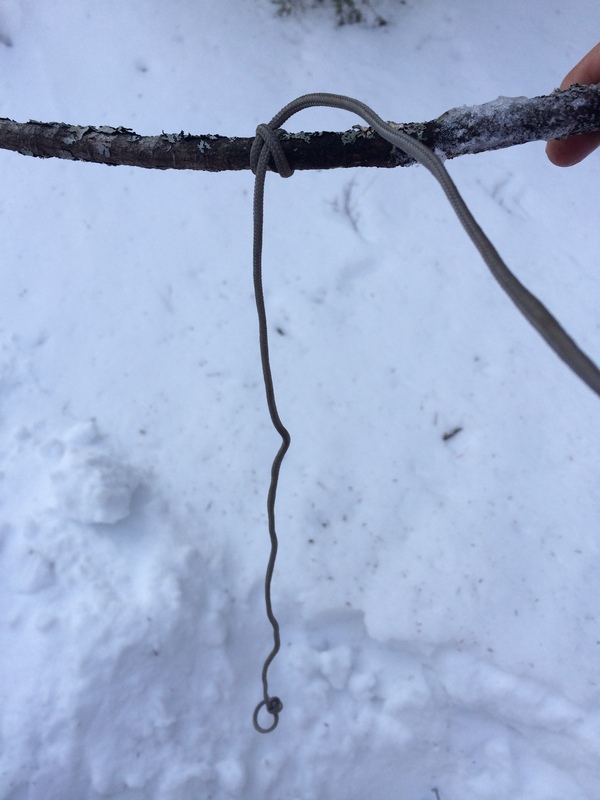 Once the hole was dug I roughly measured the depth of the hole and tied the guyline to the deadman with a clove hitch. This would place the bowline closer to the deadman than the tent, giving me plenty of room to adjust the tautness of each guyline. 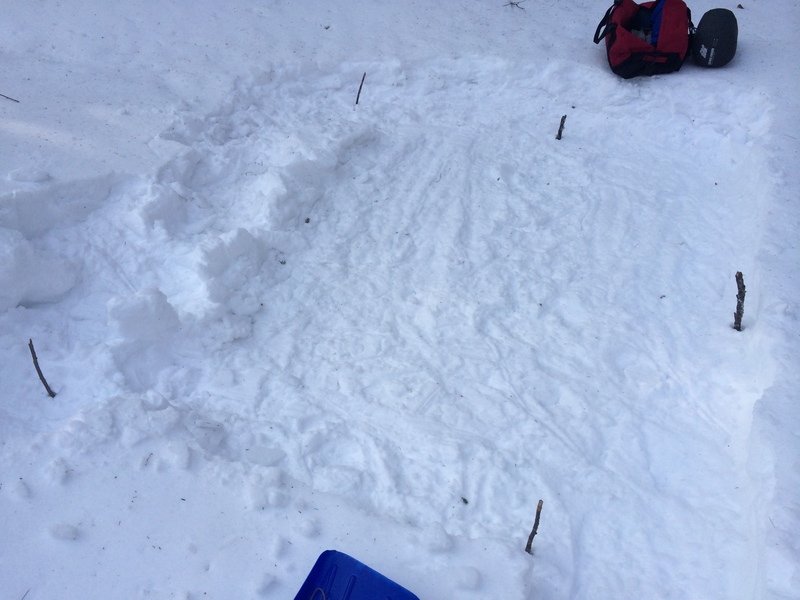 I placed the deadman in the hole and buried it, leaving both ends of the guyline sticking out of the snow. I made sure to pack down the snow so that the deadman would properly secure the guyline once it refroze. After setting all the deadmen I placed the tent back in the site and began anchoring it with the guylines. I went around in the same order I dug them, diagonally from corner to corner and the fly entrance loop last, making sure each deadman had a few minutes to refreeze before I put tension on them. To tie down, I used my typical tarp tie-down approach. 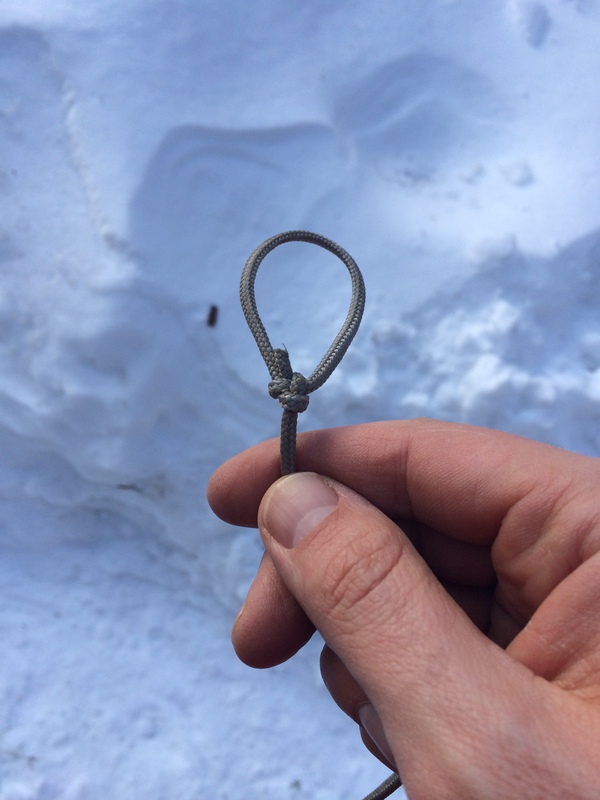 I put the end of the guyline through the loop in the tent and then fed it through the bowline on the other end of the guyline. After drawing some tension on the guyline I tied a slippery half hitch to secure it. Once I secured my tent to each deadman I went back around to put a good amount of tension on each guyline making the fly taut. 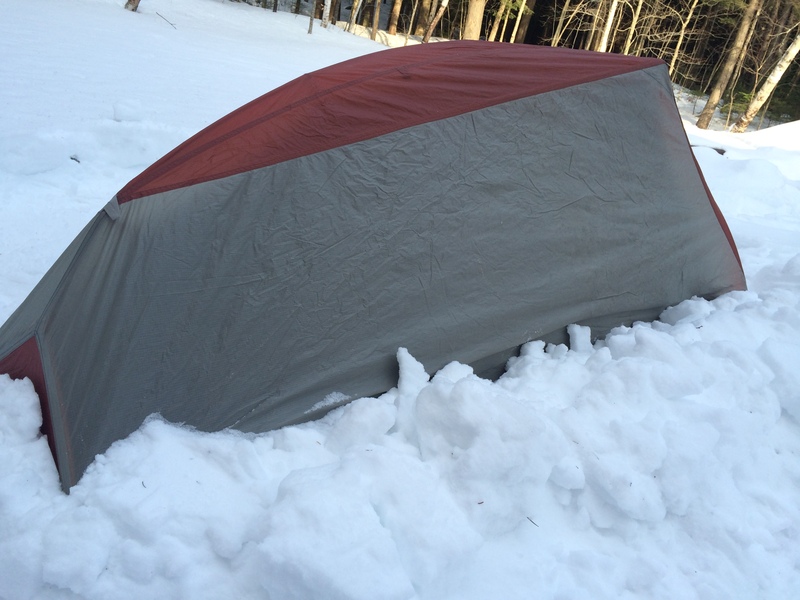 My last order of business outside the tent was to pile snow around it to make sure wind wouldn’t blow under the fly. I did this on four sides of the tent. The fifth side of the tent was the fly entrance and since it wasn’t stationary I had a fleece blanket rolled up to block the underside of the tarp from within. Inside, to make sure I would be warm, I had many, many layers. I placed my closed-cell foam (CCF) pad on the floor. 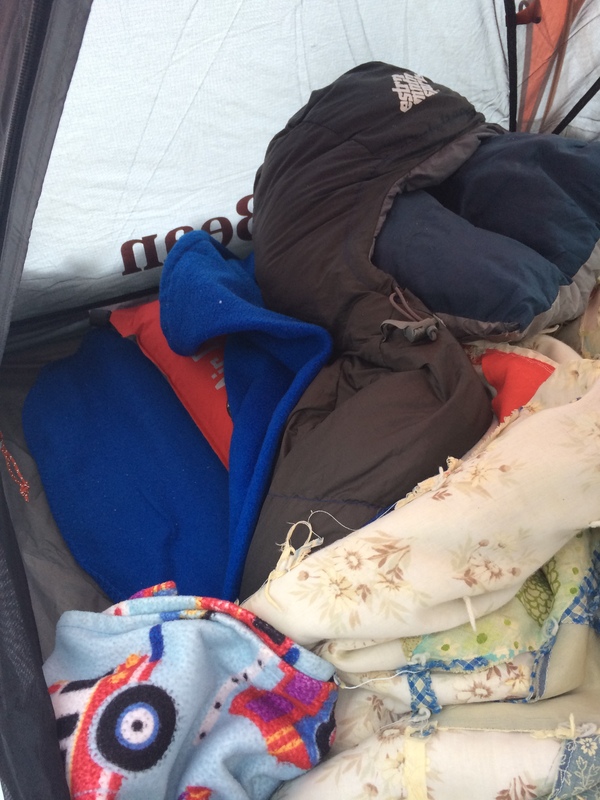 On top of it I had a fleece blanket, then my air pad, then fleece bag, then 20 degree down bag and finally a quilt. My final defense against the cold was two water bottles filled with hot water, which I placed in my down bag about an hour before hitting the sack (needless to say, I made sure they didn’t leak). When I crawled into my bag at 11pm it was toasty warm. I slept with one water bottle between my feet and the other in the space between my abdomen and legs (I’m a fetal-position, side-sleeper). The temperature dropped to 10 degrees and once again I made it through a winter night in three-season gear. This time was a little easier as I was car camping and could carry two bags and extra blankets. Regardless, I think I would have been fine without those extra layers. I even slept with my head outside of my mummy bag’s hood all night. I highly encourage everyone to experiment with their gear and refine their hiking and camping practices. I’ve acquired priceless knowledge from my experiments and reading up on related subjects. I now have a better understanding of my limits and my gear’s limits which gives me greater confidence when I wander into the mountains and better prepares me for emergencies. I would suggest starting in your backyard and reading any of the books referenced below, especially Andrew Skurka’s The Ultimate HIker’s Gear Guide (no affiliation, just one of my favorite reads on gear). Or, hit me up with questions. I’ve learned that my ability to enjoy—and to succeed in—an ambitious hike is a function of…my knowledge of the gear, supplies and skills needed for the trip. Appalachian Mountain Club. AMC Guide to Winter Hiking and Camping: Everything You Need to Plan Your Next Cold-Weather Adventure. Boston: Appalachian Mountain Club Books, 2009. Print. Canterbury, Dave. Bushcraft 101: A Field Guide to the Art of Wilderness Survival. Avon, Massachusetts: Adams Media, 2014. Print. “How To.” andrewskurka.com. Andrew Skurka. Web. 21 March 2014. “Microlight FS 1-Person Tent“. llbean.com. L.L.Bean Inc. Web. 21 March 2014. Skurka, Andrew. The Ultimate Hiker’s Gear Guide: Tools & Techniques to Hit the Trail. Washington D.C.: National Geographic Society, 2012. Print.